Visitors may scale the stairs to the top of the tower of the Romanesque cathedral in Ribe, Denmark’s oldest cathedral in its oldest town. 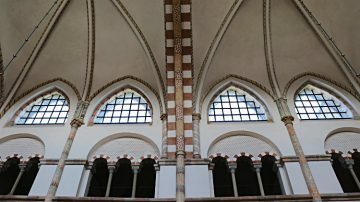 The Domkirke is also famous for its apse decorated by Carl Henning Pedersen. 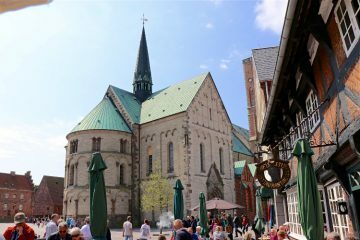 The magnificent Ribe Cathedral (Domkirke) is the most-impressive Romanesque building in Denmark and the only church in the country with five naves. 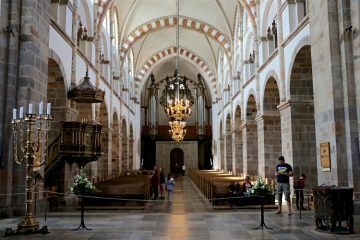 It is also the oldest cathedral in Denmark and dominates the oldest Danish town. Visitors may climb 248 stairs for splendid views of the town and countryside from the top of the commoners’ tower. 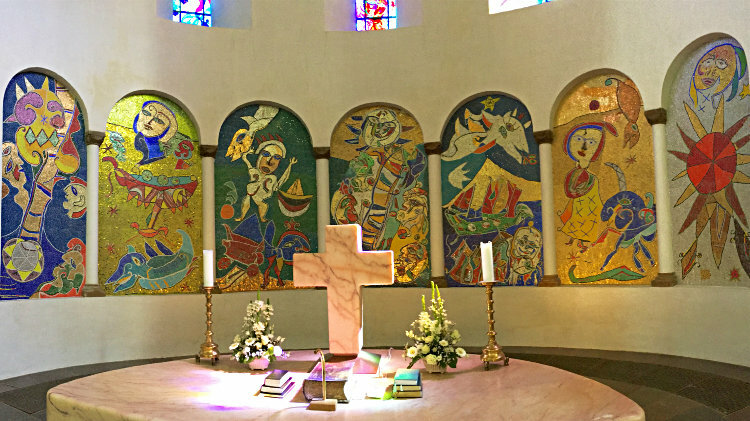 The modernist expressionist apse decorated by COBRA artist Carl Henning Pedersen adds color to the church interior. 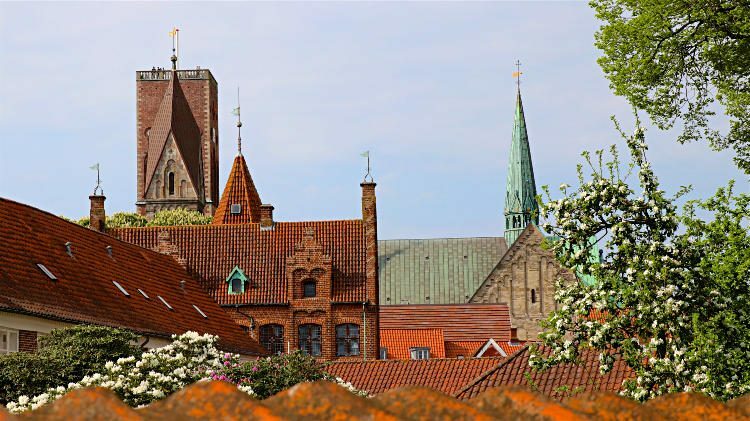 Ribe is generally considered the oldest permanently inhabited town in Denmark with the domkirke the oldest cathedral in the kingdom. 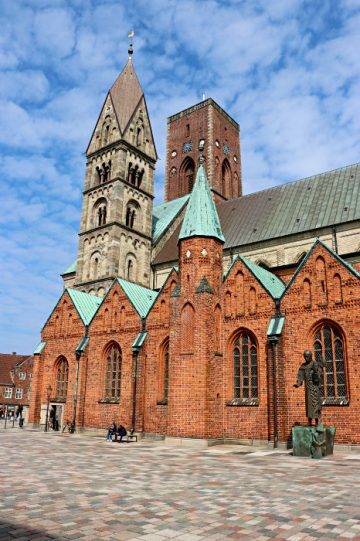 It is the best-preserved Romanesque building in the country and the only church in Denmark with five naves. 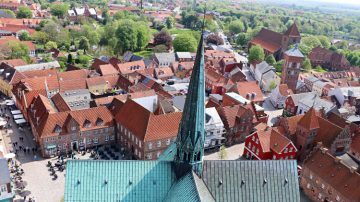 The old town center of Ribe and the cathedral are among the most-popular day-trip destinations in Denmark. From the Viking era up to the 16th century, Ribe was a very important trading harbor and religious center. However, its decline was swift and for centuries the town was too poor to replace old buildings leaving it with the best-persevered old town center in Denmark. The first church in Ribe was founded in 860 but Christianity was controversial and some Vikings claimed the church bells were scaring off the land sprites. However, after King Harald Buetooth proclaimed Denmark Christian around AD960, the church here and in Hedeby became officially important and a strong influence on daily life. Construction of the current cathedral in Ribe started in AD 1110 and was already completed in 1134. This large Romanesque church was mostly built from tufa stone imported from Germany and some parts of the church thus reminds of early churches in the Rhinelands. A fire destroyed much of Ribe and damaged the cathedral in 1176. The Romanesque core survived and the repaired church was expanded using mostly brick Gothic. The church was damaged by fire in 1402 but repaired. The church was fully restored between 1883 and 1904 to its original Romanesque-Gothic appearance. The perfect Romanesque Maria Tower, a copy of the original, was also built at that time. Many artworks were removed from the interior to return it to an incorrect nineteenth-century perception of what the original church should have looked like. 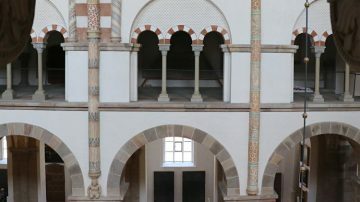 Nonetheless, the apse was redecorated by COBRA artist Carl Henning Pedersen in the 1980s in a very modern and controversial style. Ribe was built on marshlands and major buildings frequently collapsed as foundations moved. The church has sunk around 5 m since its inception and experienced related damage on several occasions. The modern sculpture outside the cathedral honors Bishop Ansgar who was the first Christian missionary in the region. It was a gift from the Ny Carlsberg Foundation on the completion of the new cathedral square on a lower level. The most dramatic effect of the shifting sands was the collapse of the northwest tower in 1283. It was replaced by the large commoner’s tower (Borgertårnet), which was used by the church on the lower levels and the city on the upper levels – partly for defense purposes. Cannons were fired from the top at Swedish ships in 1644. Most of the old houses in Ribe are from after 1580 when a major town fire destroyed the town center but spared the church. In contrast to the church, most of the old town is thus not actually medieval. The commoners tower partly collapsed five years later and was rebuilt 10 m lower than before. 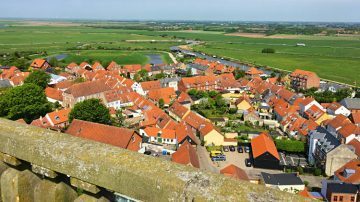 This flat topped commoners towers may be scaled by visitors for fantastic views of the Ribe and the surrounding countryside. It is 248 steps to the top of the 52-m high viewing platform. The climb is via a spiral stone staircase and then a series of wooden stairs that are not particularly narrow or steep. Hundreds of Danish families do it everyday. En route, visitors pass the six bells ranging in age from 1456 to 1869. On the way down, use the entrance to the small museum, even if only to enjoy the view of the church inside from a high gallery with useful descriptions of the most important works and architectural elements. 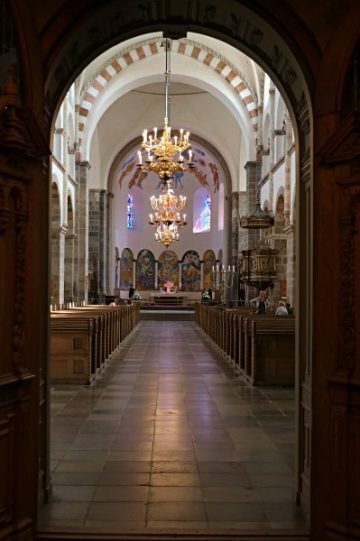 As with so many other European churches, the interior of Ribe Cathedral was overenthusiastically stripped bare during renovations in the 19th century. 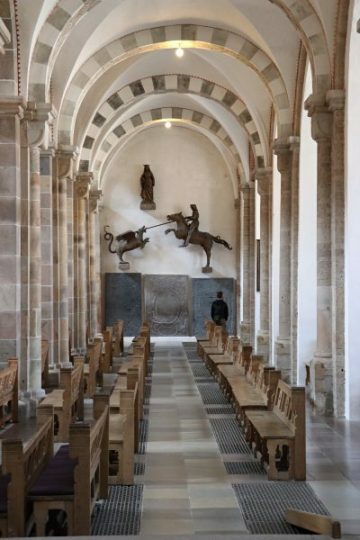 Original art in the church is thus rather limited, which partly emphasis the original architectural details such as the atlases and the clear movement from its Romanesque origins to the Gothic finishing of the upper walls and vaulted ceilings. The cast bronze baptismal font made around 1400 in Lübeck is one of the oldest and most impressive artworks in the cathedral. 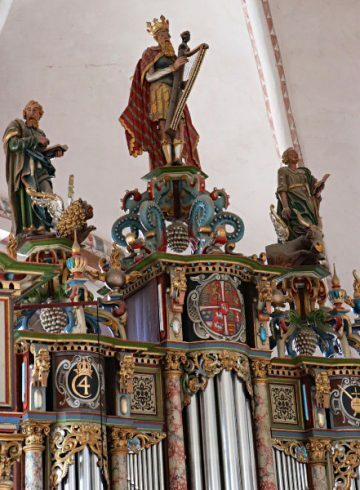 The carved wooden pulpit is from 1597. The church has numerous epitaphs and graves. The sandstone sarcophagus of King Chrstoffers I was imported from the Rhinelands in 1259 and has the oldest royal gravestone in northern Europe. A statue of St George Slaying the (rather small) Dragon in the northern aisle is from around 1475. The organ box survived from 1636 but the modern Frobenius organ was installed in 1973 and later expanded to 50 stops and around 3500 pipes. Nothing in the church is more controversial than the decoration of the apse. 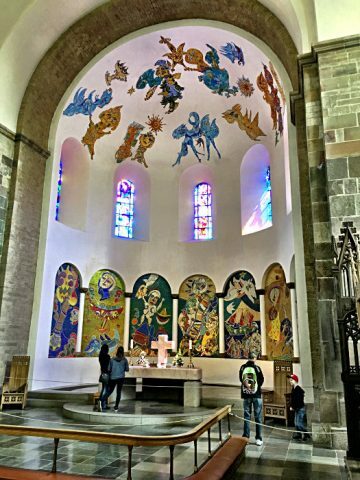 During the 1980s COBRA artist Carl Henning Pedersen (1913-2007) redecorated the apse with frescoes, stained glass and mosaics in a very bright modernist expressionist style. This Himmellængsel (Longing for Heaven) work combines mostly themes from the Old Testament with some fantasy elements. Very controversial at the time, the decorations are now largely accepted and valued and not much harder to decipher than medieval stained glass windows. The fresco has at its center a unicorn and the whole work is described by Pedersen as an allegory of human life. He was inspired by the unknown small man fresco painting from the 12th century that survived in the northern crossing. A fuller description in Danish is available at the Danish Arts Foundation. On Sundays and religious holidays the church only opens for visitors after services – around noon. See Domkirke Åbningstider for other closing dates and hours – Åbner = opening, lukker = closing and lukket = closed. 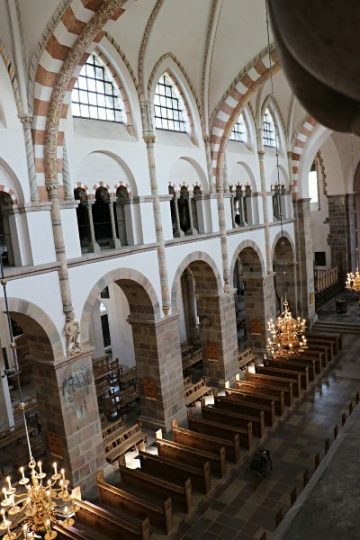 Admission to the church is free while access to tower (with small museum and gallery view of the church) is DKK20 for adults, and DKK10 for children under 18. Ribe is hugely popular with day-trip bus groups. Few would regret staying over and enjoy this beautiful town in the evening and early morning without the tourist masses. However, hotel accommodation is rather limited making early reservations sensible.